The moral law of the Ten Commandments is an expression of God’s character; it is the standard of all righteousness, an expression of His will. The Holy Bible was written by men under inspiration of God. “For the prophecy came not in old time by the will of man: but holy men of God spake as they were moved by the Holy Ghost” (2 Peter 1:21). 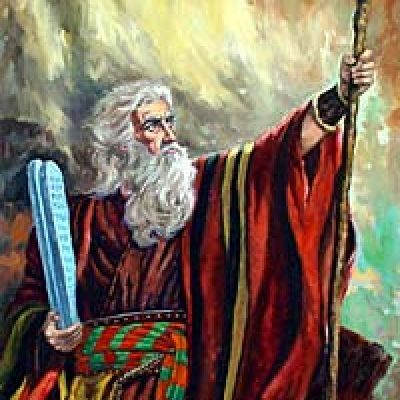 The moral law of the Ten Commandments was not given by inspiration, but was written by God’s own finger on tables of stone. “And the LORD said unto Moses, Come up to me into the mount, and be there: and I will give thee tables of stone, and a law, and commandments which I have written; that thou mayest teach them” (Exodus 24:12). “And he gave unto Moses, when he had made an end of communing with him upon mount Sinai, two tables of testimony, tables of stone, written with the finger of God” (Exodus 31: 18). See the Moral Law (Exodus 20:3-17) and (Deuteronomy 5:7-22). The moral law is the embodiment of two great principles: Love toward our Creator and love toward our neighbor. When a lawyer asked Christ “Master, which is the great commandment in the law? Jesus said unto him, Thou shalt love the Lord thy God with all thy heart, and with all thy soul, and with all thy mind. This is the first and great commandment. And the second is like unto it, Thou shalt love thy neighbour as thyself. On these two commandments hang all the law and the prophets” (Matthew 22:36-40). The transgression of the moral law is called sin. Therefore, “Whosoever committeth sin transgresseth also the law: for sin is the transgression of the law” (1 John 3:4). Of the moral law Jesus says, “Think not that I am come to destroy the law, or the prophets: I am not come to destroy, but to fulfil. For verily I say unto you, Till heaven and earth pass, one jot or one tittle shall in no wise pass from the law, till all be fulfilled. Whosoever therefore shall break one of these least commandments, and shall teach men so, he shall be called the least in the kingdom of heaven: but whosoever shall do and teach them, the same shall be called great in the kingdom of heaven” (Matthew 5:17-19). The ceremonial or provisional law was added because of the transgression of the moral law. The ceremonial law consisted of ordinances, ceremonies and sacrifices in the sanctuary system that pointed to the future redemption through Jesus Christ. This law typified the mysteries contained in the plan of redemption in Jesus. In the celebration of the Passover feast and the first fruit offering required to the Jewish people, God gave specifications to be observed that clearly represented Christ. The Bible says “Thou shalt not offer the blood of my sacrifice with leaven; neither shall the sacrifice of the feast of the passover be left unto the morning. The first of the firstfruits of thy land thou shalt bring unto the house of the LORD thy God” (Exodus 34:25-26). The apostle Paul says: “Purge out therefore the old leaven, that ye may be a new lump, as ye are unleavened. For even Christ our Passover is sacrificed for us” (1 Corinthians 5:7). Concerning the first fruit offering he later writes: “But now is Christ risen from the dead, and become the firstfruits of them that slept. For since by man came death, by man came also the resurrection of the dead. For as in Adam all die, even so in Christ shall all be made alive. But every man in his own order: Christ the firstfruits; afterward they that are Christ’s at his coming” (1 Corinthians 15:20-23). After Christ’s death, the ceremonial law is no longer to be observed. Therefore “blotting out the handwriting of ordinances that was against us, which was contrary to us, and took it out of the way, nailing it to his cross; And having spoiled principalities and powers, he made a shew of them openly, triumphing over them in it. Let no man therefore judge you in meat, or in drink, or in respect of an holyday, or of the new moon, or of the sabbath days: Which are a shadow of things to come; but the body is of Christ” (Colossians 2:14-17). The laws consisting in ordinances, typifying Christ’s death was the one nailed on the cross, “having abolished in his flesh the enmity, even the law of commandments contained in ordinances; for to make in himself of twain one new man, so making peace” (Ephesians 2:15). “For the law having a shadow of good things to come, and not the very image of the things, can never with those sacrifices which they offered year by year continually make the comers thereunto perfect” (Hebrews 10:1). God wants to make a new covenant with His children, and that covenant consists on writing the moral law in their minds and hearts. “Behold, the days come, saith the Lord, when I will make a new covenant with the house of Israel and with the house of Judah. . . . For this is the covenant that I will make with the house of Israel after those days, saith the Lord; I will put my laws into their mind, and write them in their hearts: and I will be to them a God, and they shall be to me a people” (Hebrews 8:8,10).